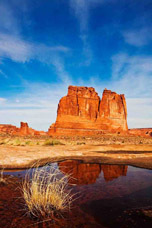 Moab, Utah area offers some of the most spectacular scenery on earth. Moab is part of the Colorado Plateau surrounded by beautiful red rock canyons, the Colorado River, and the 12,000’ La Sal Mountains, as well as Arches and Canyonlands National Parks and Dead Horse Point State Park. In addtion, There are numerous opportunities to photograph petro glyphs, Indian ruins, and stunning rock formations. This private workshop will take you to locations that will inspire you including the Meas Arch, Courthouse Towers, Dead Horse Point, Turret Archs, Delicate Arch and other scenic destinations in Moab area. Our workshops are led by group leaders with intimate knowledge of the area and exceptional photographic and workshop experience. Our sessions are highly personalized and designed to maximize one-on-one interaction with participants and further develop photographic skills. Please bring your own equipment. We recommend a sturdy tripod, circular polarizer, and split natural density filter. Wide angle and medium focal length lenses (17mm ~ 80 mm) . A notebook computer with photo editing software for post shoot critique is also recommended. 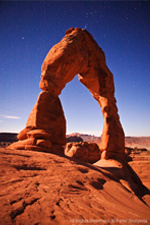 See more Moab, Utah pictures.